This round is open for two days of discussions and voting. Polls open at 12 noon EST Sept. 12th. Close 11:59:59PM Sept. 13th. PM all votes to me and just provide me your 2013 CB Draft winning team. After the announcement that the Minnesota Timberwolves had won the 2013 CB Draft Lottery, the front office quickly decided that LeBron James would be the first overall selection to lead our franchise. Any team that features LeBron is instantly a contender, but to win a championship he must be surrounded by the right pieces. The organizational philosophy here in Minnesota is defense first. Every player that we drafted is capable of playing anywhere from above average defense to elite defense. In addition to defensive skill, we also targeted players who could provide specific skill sets to the team. Those skills ranged from spot-up shooting, slashing, finishing around the rim, ball-handling and facilitating. This is a team designed to provide stifling defense that will lead to easy baskets in transition after turnovers or missed shots. In half-court offensive sets, we have many options to spread the floor to allow LeBron, Monta, or Farmar to drive and dish. We also feature versatile off-the-pick options. Jordan is an elite pick & lob finisher and both Ibaka and Davis are quality pick & pop or pick & roll players. LeBron is unquestionably the alpha-dog on this team which will allow Monta plenty of room to pick up easy points slashing to the rim to assist in the scoring load. In addition, this team features a slew of three point shooters around the perimeter in Korver, Battier, Chalmers, Miles, Bradley, and Farmar. My selection of DeAndre Jordan at 4.1 was highly scrutinized and was my most difficult draft selection. I felt that quality big-men were flying off the board quickly and despite his flaws - he was a good fit for the team. My other contemplated selection at 4.1 was Monta Ellis who I managed to acquire at the beginning of the 5th round despite passing him at 4.1. 3) Jordan Farmar - Quality facilitator, shooter, and shot creator that was acquired with the last selection of the draft. Not many 13th rounders are cracking rotations so I was happy to secure him when I did. There was one move made that caused me to second-guess myself - the trade of Taj Gibson and a draft pick for Kyle Korver and Mario Chalmers. I felt it was a good trade because it allowed me to play LeBron at the power forward position more often while acquiring two elite three point shooters in the process. However, I was happy with the Gibson selection because of his great pick & roll defending, but I felt the acquisition of Korver and Chalmers along with James' minutes at the 4 outweighed his departure. I sincerely hope that people don't overlook my team defense. I know it isn't a flashy fantasy team style, but tough defensive teams always contend regardless of the sport. Pair that with the best player on the planet, three point shooters, and a deep bench and I expect to contend for the CB Draft Championship. Team Motto: No superstar, no problem. Quote: "The most versatile true big man in the league." - Roy H.
Al Horford is one of the most versatile players in the entire NBA. The two-time All Star can operate down low and he can hit a 20 foot jumper. He can rebound and he can pass. He can run the floor and he can work off screens in the half-court. He is strong enough and quick enough to defend any PF or C in the league, and he does it well. There isn't a weakness to be found in his game. Some on the forum were surprised we chose him ahead of other defensive Cs, but there's the magic of it: Al won't be playing C.
Al's natural position in this league is PF. Why, then, has he started at C for the Hawks nearly every game during his six-year career? Because of a guy named Josh Smith, a tweener forward who really can't shoot well enough to be considered a SF. So while Smith flails around and takes ill-advised midrange jumpers (don't worry DKCers, Thibs will take care of that behavior), Al has to be prudent and do the dirty work for his team. Because of this, and because he plays in Atlanta, Horford often gets much less attention than his frontcourtmate. But that doesn't mean he isn't a brilliant player. Last season, returning from an injury-riddled 2011 campaign, Al didn't miss a beat. In 37 minutes per game and 74 games, Al averaged 17.4 pts on .543 shooting, 10.2 trb, 3.2 ast, 1.1 stl, and 1.1 blk. As you can see, he scored comfortably from anywhere inside the 3pt line. 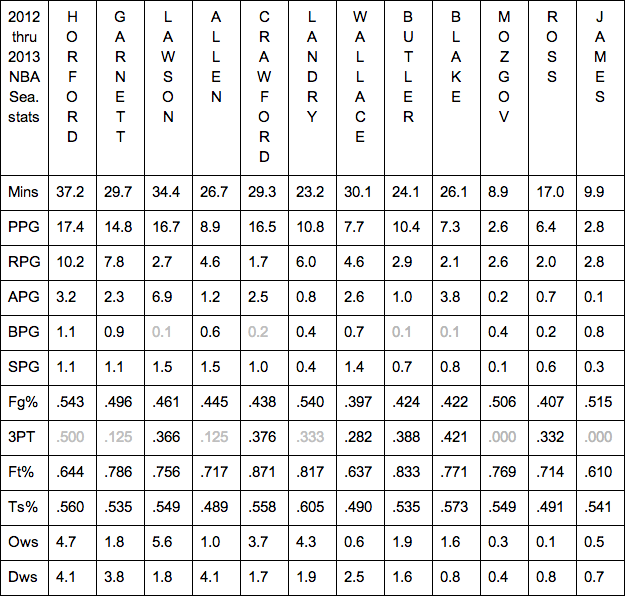 This versatility of scoring options means that teams can't leave Al alone no matter where he is on the court. This is a huge asset on the offensive end, as it means that Al's teammates will be that much more open to take their own shots. On the other side of the court, Al is elite as well. His 7'1" wingspan is disruptive to say the least, and he is extremely quick for his size. Additionally, Al is an extremely intelligent player, and knows where to position himself for a rebound, a block, etc. 37 years old | 6'11", 253 lbs | Farragut H.S. Jokes aside, there are those around the league who are concerned about Kevin's durability as he continues to climb in age. There are question marks about whether he's still effective offensively, as his body can't take the abuse that comes with operating down low in the NBA. I'll tell you this much, though: Kevin's midrange jumper is still as good as ever. Like, freaky good. This combined with Al's ability to work near the basket means that Kevin will by no means be a liability on offense, and will be able to work his magic on defense. But while Kevin's true strength his his defense, you can never discount his ability to come up big in the clutch. Search "Kevin Garnett game winner" on YouTube and you'll see there are too many videos for me to post. But I will post my favorite clutch play by Kevin during his Celtics tenure. Who's got goosebumps after watching that? I get them every time. Kevin will come up big when it matters most, and that can vault a team to contention more than any statistic. On the subject of statistics and clutchness, though, I'd like to quickly mention last year's playoffs. In the six games the Rondo-less Celtics played, Kevin played 35 minutes and averaged 12.7 pts on .500 shooting, a league-leading 13.7 trb, 3.5 ast, 0.8 stl and 1.0 blk. This was after playing only 30 minutes per game during the regular season and missing 14 games. So while Kevin might not be around for the entire regular season, you can expect him to be coming full force during the playoffs. He'll be there shouting nonsense at Melo, sacrificing his body for the team, and making his teammates better with his passion and intelligence. In case you can't tell, I love KG. Quote: Height is a blessing, but speed kills. Ty Lawson is a criminally underrated point guard by a great number of fans around the league. Last season, he led the third-seed Nuggets in scoring to the tune of 16.7 pts on .461 shooting (.366 3pt and .549 TS%). He is one of the fastest players in the league, and can finish at the rim or dish it out with ease and finesse (6.9 ast last season). He came up huge in the playoffs, upping his numbers to 19.5 pts, 7.3 ast, 1.5 stl, and even 3.1 trb. Heck, he put up 35 and 10 in one game against the Warriors. So why is Ty so underrated? He's adorable. I'd hug him if he weren't holding two pickaxes. ...but why should that make him fall to nearly a full round after other extremely similar PGs? If you pay attention to that link, you'll notice that Ty scored the second most points per 36 on the best FG%, averaged the second most assists, and had the second most win shares, but he's still considered a tier below the other three. I've concluded it must be because Ty hasn't gotten much exposure as a member of the Nuggets before this last season. This dude is good. Really good. And clutch. Really clutch. (Tell me a part of you giggled when he did the bernie after making that shot). Ty Lawson is an elite PG in this league; top 10 by many people's rankings. He will operate beautifully with Kevin and Al, and that trio will lead the Cavs to victory on more than one night. 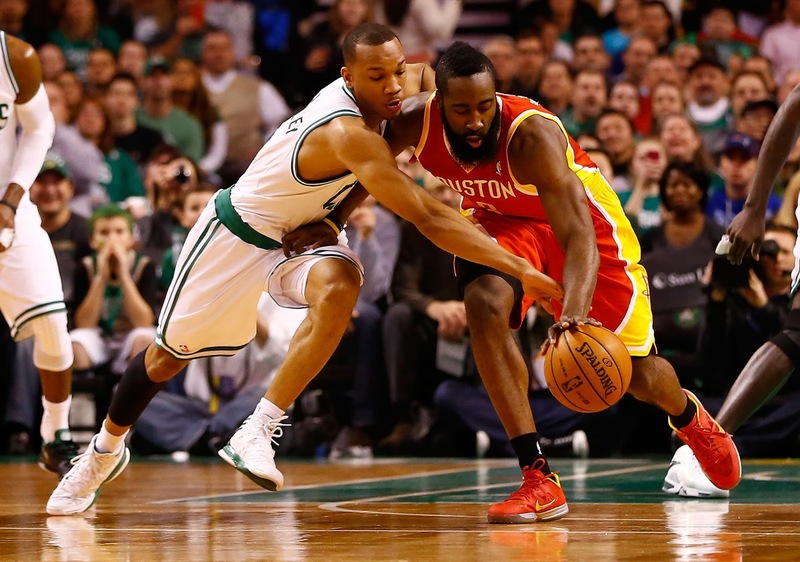 Quote: The best offense is a good defense. Tony Allen is a defensive monster. He has shut down Kobe Bryant, Russell Westbrook, Kevin Durant, and even contained LeBron James (as best as anyone can). He's been called the best wing defender in the league outside LeBron by a good number of people (one particularly good article here). Tony's a 3-time all-defensive selection. He has 19.2 total defensive win shares throughout his career (4.1 DWS last season alone) while never playing over 27 minutes per game. He's a strong rebounder for his position and a very intelligent player, in addition to his toughness. Along with Marc Gasol, he set the tone for an elite Memphis defense night in and night out last season. There isn't much else to say about Tony besides his defense, but that's the nature of defense in this league, and not Tony. Along with KG and Horford, Tony will help make the CB Cavs the best defensive team in the league. After a largely disappointing campaign with the Blazers in 2011, Jamal regained the effectiveness of his younger days by becoming the sixth man for the Clippers. His shot creation, 3pt shooting (.376), and efficiency (.558 TS%) were all excellent with the Clips as he settled into his role as the primary scorer in the second unit. 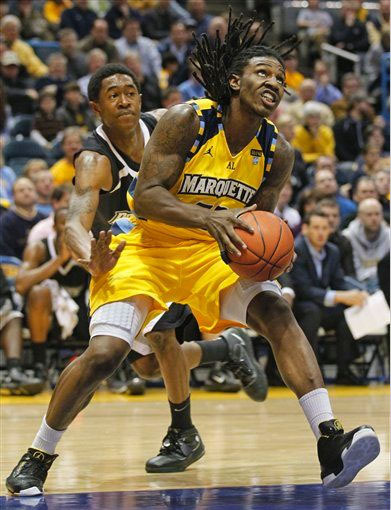 Jamal was on the court for many end-of-game situations, replacing 3-and-D guy and starter Willie Green. Many teams have adopted the philosophy of starting a defending wing and bringing the scorer (and better player) off the bench. The Clippers did it and the Thunder have done it. Well, now the Cavs will do it. Along with Tony, Jamal completes the playoff SG rotation, forming a strong defense-offense duo that can be subbed out given the situation. For a team with many defensive studs, it seemed only right to add a guy whose true forte is offense. Jamal is gonna make your guy look like a fool this season, so be prepared. Carl Landry is just a beautiful scorer. Dude had a .605 TS% last season, and could put it in the net from anywhere on the floor. Add in some strong defense and rebounding and you have yourself the perfect backup PF and third big man after Al and Kevin. Like Ty, Carl came up huge in last years playoffs, averaging 11.8 pts on .520 shooting and 5.2 trb in just 20 minutes. With the Cavs, Carl will certainly see more than 20 minutes per game, averaging somewhere around 30 in the regular season and post-season. His efficiency isn't expected to decline with this change, as he's been highly effective in around 10 minutes (Feb 20) and upwards of 30 minutes (Feb 24). In fact, with an increase in minutes per game, we expect Carl to put up bigger numbers than last season; 13 pts and 8 trb is the prediction. Gerald is tough. Like, really tough. He's not much to write home about on the offensive end anymore, but he can still defend the best 3s and 4s of the league. Like Tony and Kevin, he'll put his body in harm's way for the sake of the team - whether it's the smart play or not. He'll function primarily as an energy guy and enforcer off the bench, but will start in select match ups against stronger SFs and quicker PFs. Also worth mentioning is his significant improvement offensively during last year's playoffs, where he averaged 12 pts on .463 shooting (.379 3PT), 4.0 trb, and 2.4 ast in 35 minutes. Gerald may or may not be cooked, but if he can continue that type of production into this year's regular season, he'll likely earn the starting SF job from Caron. Melo: I'm scared. If I just look away, maybe he won't hurt me. 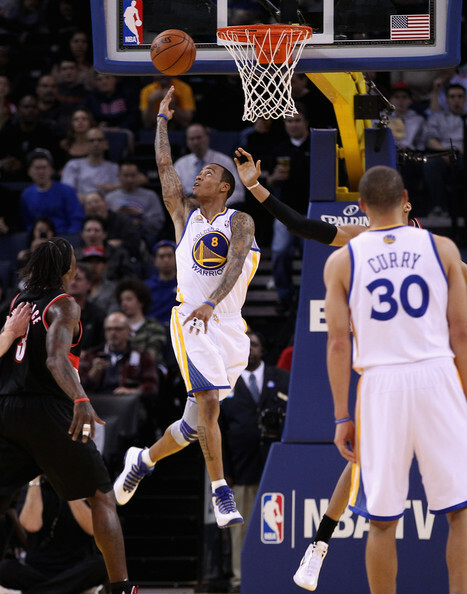 Caron was brought in for his excellent 3pt shooting (especially from the corners), which he will bring to the starting lineup. Along with Ty (and Al and Kevin) he will spread the floor for the big guys to operate and for Ty and Tony to slash. He is the 4th offensive option of the starters, and he knows and is used to this from his time with the Clippers. However, that doesn't mean he can't go off at any given time, even in this late stage of his career. Caron's shooting will be invaluable in certain situations, and he's no slouch on the defensive end either, earning the nickname Tough Juice for his tough style of play. Scola ain't gonna even try. Blurb: Steve will be the primary backup ball-handler during the regular season, and will supply some much-needed 3pt shooting in certain situations. Blurb: Timofey will be used as a backup C to Kevin and Al, with his minutes increased on nights that Kevin rests. His size and rebounding will be assets to the team. Blurb: Terrence will be an energy guy in certain situations, but will only see major minutes in the case of an injury or in garbage minutes. Blurb: Bernie has the opportunity to surpass Timofey on the depth chart. As a 27-year-old rookie last season, he was a shot-blocking presence in his limited minutes with the Mavs. Blurb: Lamar will likely not see the court with the Cavs due to his troubles during the offseason. Cavs management wishes him the best of luck with his personal endeavors. Notes: Gerald Wallace will start in place of Caron Butler (or at PF alongside Al Horford at C) to guard elite SFs and more mobile PFs (LeBron James, Carmelo Anthony, Josh Smith, etc.). Injury and garbage minutes will be given to Terrence Ross and Bernard James. Kevin Garnett isn't getting any younger, and will not only need to further reduce his minutes this upcoming season but likely sit out the second game of back-to-backs. How will you adjust to this? Say hello to Carl Landry. We not only have confidence in Carl as our third big man, but we believe he is more than capable in taking over the starting PF job when Kevin rests, with Al [Horford] sliding over to the C spot. We will monitor Carl's minutes so that there isn't too much variation from a bench night to a starting night, but he should be looking at roughly 30 minutes on any given night. Gerald [Wallace], Tim [Mozgov], and Bernie [James] will also see increased minutes when Kevin takes a night off, but nothing they can't handle. Many considered Jamal Crawford to be the true Sixth Man of the Year last year for the Clippers. How will you ensure that he gets enough minutes to be effective? Jamal will continue to see a sixth man role with Cleveland, and he will see starters minutes. Tony [Allen] has always played slightly less minutes than the average starter, so that alone would ensure Jamal plays enough, but we also plan on letting Jamal run the offense as somewhat of a PG, and Tony will get a good helping of minutes at the SF spot as well. All of this combines to mean that Jamal will get around 30 minutes a night, same as our other key bench player, Carl. Gerald Wallace has seen a severe decline in offensive efficiency these last few years. Are you at all worried about him being a major bench player on your team? While we agree with the first statement, we aren't worried. Quite the opposite: we see Gerald as a perfect fit on our team. We are confident in the amount of scoring that Ty [Lawson], Al, Kevin, Jamal, Carl, and even Caron [Butler] will give us; we do not expect scoring from Gerald at all. Gerald will be used purely as a defensive stopper against more skilled SFs and quicker PFs in the league, such as LeBron James, Carmelo Anthony, and Josh Smith. Gerald will start select games at SF or PF where the matchup makes sense, but even in that role we won't be expecting offense from him. Anything he can give us on that end of the floor is found money. 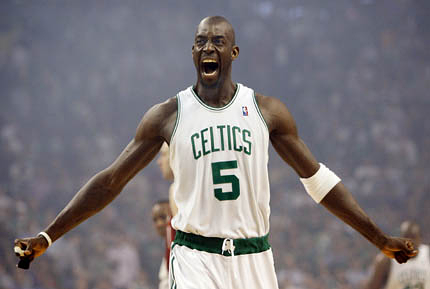 It seems you have the pieces to create a formidable defensive lineup with Lawson, Allen, Wallace, Horford, and Garnett. However, the floor spacing here could be quite poor. Do you agree? In short, no. But I'll go into detail. The obvious source of worry here is Tony on the floor with Gerald as the two wings, and the lack of three point shooting that combo brings. While both are certainly subpar at that aspect of the game, there are several reasons that we are not concerned. First, Kevin and Al (and Carl) are excellent long-range jump shooters for their positions, which will create some floor spacing on its own. Second, Gerald himself saw a significant improvement in three point shooting during the playoffs last season, something he could certainly continue into this season. And third, the lineup you mentioned would soon be rotated out to accommodate Jamal, Caron, Steve [Blake] or even Terrence [Ross], who can all shoot the three ball. The only time you would see that lineup playing significant minutes together is in the case that we absolutely need a stop. Can you comment on your coaching selection, or was Lionel Hollins chosen somewhat at random? Lionel was absolutely not chosen at random. Aside from most recently coaching AB_Celtic’s second-favorite NBA team (the Grizzlies), Lionel is an excellent defensive coach; last year, he helped the Grizz become the best defensive team in the league in terms of opponent points per game (89.3). He was crucial in the development of last year’s Defensive Player of the Year, Marc Gasol. He has a rapport with defensive specialist and new CB Cavalier Tony Allen. He has playoff experience. He is humble, supportive, and has a great basketball mind. He will undoubtedly mesh with the mindset of the CB Draft Cavs. Kevin Garnett and his CB Cavs expect nothing less than a title. I see Lebron having a big series. Does Minnesota win it, though? I'd like to congratulate AB & Air for making to the finals in their 1st go around. That certainly is an accomplishment (much better than I did). That said, and as nice of a guy as AB in particular is, I just don't see it. Too weak in the wings. I'm baffled they made it this far. To me, wings are more important than bigs in today's NBA. Likely leaning Minny in this series, because LeBron is LeBron. Maybe if the Cavs had a Paul George type they would have a chance. Also, if I'm not mistaken, this is Pits 1st go around at this as well. That is another job well done. Although, when you get the top pick (LeBron), it seems you more or less just have to 'not screw it up'. Still, that is a good amount of pressure, one would assume. My initial reaction is to lean toward Cleveland. I think they've got the personnel and the defensive philosophy to limit Lebron. If Lebron isn't scoring 35+ per night, I don't think that Minnesota can win this series. I've made my opinion of Gerald Wallace The Celtic widely known. Gerald Wallace The Defender, though, is a completely different player. Since you don't have to worry about his contract in this game, Wallace is a very valuable piece. I think that Gerald Wallace has the potential to replicate what Shawn Marion did to Lebron in the 2011 Finals. He only averaged around 13 points per game, but he was arguably the MVP of that series, because he hassled Lebron at every turn. I can see that here. In fact, I do see that here. I think this is a series where both teams will can and will go small. Cleveland on the perimeter dropping Caron/G-Wallace for Jamal Crawford to better matchup against that undersized backcourt of Minnesota's. And Minnesota dropping D.Jordan and going small with LeBron at PF on KG or Horford and Battier sliding in at SF. I don't think Garnett is prolific enough in the low post to beat up LeBron down there regularly enough to scare Minnesota away from that matchup. I think they will live with the 2-4 post ups a game Garnett tries on LeBron in order to take advantage of their much improved offense on the other end. A net positive for Minny. Nah. KG still trumps Ibaka. As has been noted previously, Ibaka is a poor man-to-man defender. He doesn't help a defense in nearly the same way that KG does. Statistically, KG is better offensively (I'd buy that), he's certainly a better passer, and he's dominated Ibaka head to head. I definitely don't rate this one as even. I think KG's defense has been declining and will drop-off considerably more once he transitions back to PF. So as defenders, I think they are comparable. I would actually give Ibaka the edge at PF (but KG at C). I give KG an edge on offense due to his passing ability (Ibaka limited passer, KG a great passer). However, as scorers + jump-shooters, I think they are even. And, I don't think KG can score in the post consistently against Ibaka which is KG's only possible shot-creation advantage over a player like Ibaka. As possession creators, I think Ibaka forces far more turnovers and can rebound outside his area which KG can no longer do (increasingly important when rebounding as a PF vs C when you have to cover more ground to rebounds). Advantage Ibaka. + Athletic, long-armed, shot-blocking ace still learning fundamentals. + Overrated defender who struggles against floor-spacers. Good rebounder. + Very good midrange shooter. No post game and poor offensive instincts. There's a lot more to defense than blocking shots, people. Ibaka finished second in the Defensive Player of the Year voting based on his phenomenal shot-blocking total, but the Finals really underscored how far he has to go to be an elite defender overall. Ibaka's shot-blocking skill is second to none -- his 5.38 blocks per 40 minutes led the league comfortably (see chart) -- but he still struggles mightily against face-up 4s and in the finer elements of help defense. Overall, then, he was merely decent defensively. The Thunder were better with him on the court but not dramatically so (2.8 points per 100 possessions), while Synergy Stats rated him in the middle of the pack. The Thunder didn't act like he was a vital defensive cog, either, often opting to keep Kendrick Perkins or Nick Collison on the court instead of him. I give KG a small edge on offense due to his passing ability (Ibaka limited passer, KG a great passer). However, as scorers + jump-shooters, I think they are even. And, I don't think KG can score in the post consistently against Ibaka which is KG's only possible shot-creation advantage over a player like Ibaka.